It is headed by Taranov and Tseholko. 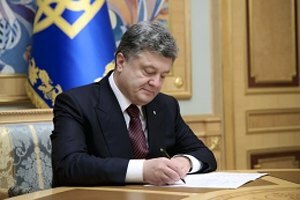 President Petro Poroshenko has signed the decree "On the council on the issues of protection of journalists' professional activity and freedom of speech", according to his official website. The council is a consultative body under the president's auspices. It is tasked with monitoring the situation with the protection of journalists' professional activity and freedom of speech in Ukraine and developing proposals on the matter. "The council has been formed to ensure the enforcement of the constitutional right to freedom of speech, build an effective mechanism of interaction between government agencies and civil society institutions, including mass media, to prevent any obstacles to journalists' professional activity," the website said. The council includes representatives of media NGOs, the National Police, the Prosecutor-General's Office, the Security Service of Ukraine (SBU), the National Council for TV and Radio Broadcasting and other government agencies. The council will be co-chaired by a deputy head of the presidential administration, Andriy Taranov, and press secretary Svyatoslav Tseholko.